Companies can gain a competitive advantage and reduce costs by making their products using non-toxic chemicals, solvents and processes. Learn how start-up labs like the Warner Babcock Institute are helping companies create new product composotions which are safer and do not cost more. Be inspired by the many programs and initiatives at publishing company EBSCO located in Ipswich, Massachusetts. Learn how the Green Team helps empower employees to implement ideas on reducing waste and energy. Climate Talks a Step in the Right Direction, Dec 31, 2009. World leaders and delegates from 188 nations agree upon the Copenhagen Global Climate Accord. First time in history that so many leaders came together to discuss and negotiate on one single issue. 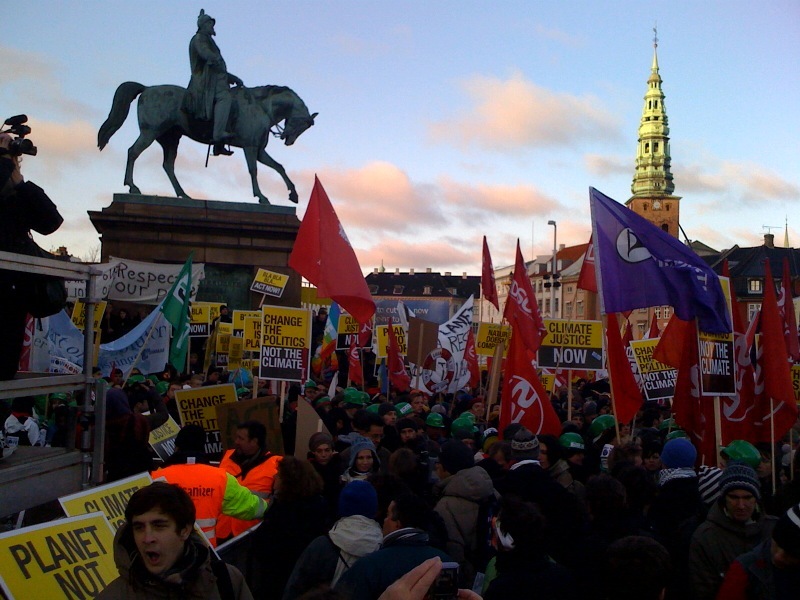 The importance of reducing harmful emissions gains important momentum in Copenhagen in December 2009. President Obama shows leadership in taking responsibility for addressing climate change. House passes landmark climate legislation. July 2, 2009, Beverly Citizen. Landmark legislation in support of emissions restrictions, fuel efficiency, and clean energy technology and services passed the House for the first time in history. Now let's hope the Senate can pull through! Competition brings out the best for the environment, May 10,2007. Learn about the ICE competition in May 2007. The Fifth Annual ICE Competition will begins in spring 2009 and more information about joining teams can be found at www.ignitecleanenergy.com. Getting a charge out of Detroit auto show. January, 29, 2009. A reflection on the past and future of Detroit. New political will in the White House for mandating fuel efficient cars. Will the Big Three Automakers be committed to high performance fuel economy for the future? Green highlights of the show featuring Plug In Hybrids from Fisker and GM. Ford's cooperation with utilities for electric grid hook up. Electric Cars no longer a shocking prospect. December 11, 2008. Brief history of electric cars in the U.S. plus companies to watch such as Azure Dynamics, Vectrix, A123 Systems, and Better Place. Highlights from the New England Clean Energy Conference. Sitting in on the fuel efficiency cafe. October 2, 2008. Review of fuel efficiency of cars in the U.S. These cars not blowing smoke on energy solution. August 14, 2008.Massachusetts Hydrogen Coalition hosts Cambridge stop of the Hydrogen Road Tour. No Idle Improvement to air quality. May 1, 2008. Anyone can become a Hypermiler. June 19, 2008. How to get more miles per gallon by changing your driving techniques and habits. Dispersants used by BP are toxic. July 1, 2010. Viewing China through the smog. November 20, 2008. What is China doing to reduce pollution? Is the government enacting Clean energy legistlation? How does the per capita emissions rate compare for Chinese versus Americans? The long, local clean energy connection. June 7, 2007. Learn about the history of America's oldest solar site. How did Beverly, MA get the only federally funded solar test site east of the Mississippi back in 1980? What is the legacy of the only site remaining from the Carter Administration? Celebrate the Sun, Art and Clean Energy. June 5, 2008. Did you know that the U.S. average carbon dioxide emissions is 41,500 pounds per year for a household of two people? How much of this comes from your electricity consumption? From your car emissions? From your heating consumption? How much can walking or biking for nearby errands help redcue carbon emissions? Cape Wind Not Blowing Smoke. March 1, 2007. Learn about the potential of America's largest offshore wind farm project- Cape Wind. For years grass roots organizations such as Clean Power Now have been struggling against the well funded pockets of the wealthy Nantucket Island summer residents in an effort to allow the building of what would be America's largest offshore wind farm. Learn how harnessing the wind for power instead of coal powered polluting energy plants offer an alternative for the future. These People are Fighting for You. April 23, 2009. Goldman Prize Winner Maria Gunnoe is awarded for her efforts to raise awareness about the destruction of the Appalachian mountains and streams for coal extraction from strip mining. The documentary Burning the Future: Coal in America features Maria and her neighbors and tells the story of mountaintop removal. Local Massachusetts heros such as Jan Schlichtmann and Mary Rodrick are awarded at Salem State College for their efforts to get water contaminated by the local coal plant cleaned up and safe for drinking. Lisa Lillelund has published over 60 columns relating to sustainability and the environment. Her articles have appeared in various print and online publications throughout the world. As a regular columnist for a GateHouse Media publication, the Beverly Citizen and www.wickedlocal.com/beverly, Lisa's columns often appear in some of the other over 400 community print and online newspapers of GateHouse Media throughout the Unites States. These columns have also been featured on many companies home pages such as Best Place as well as many foreign online websites in Europe and Asia. Lisa's columns have also appeared in GreenBiz.com and on Reuters. Mango Networks All rights reserved.